We are going to fly across an entire continent and an entire ocean. Then we are going to drive thousands of miles and will probably sleep for at least several hours in order to come and play some songs for you. That’s how much we like you. Sheesh! It's only March and this year is shaping up to be pretty swell. For starters, we get the distinct honor of opening five shows for The Brian Jonestown Massacre this May and now I can announce that The Davidians have been added to the roster at El Borracho Bookings and will be embarking on our first ever tour of Europe for the entire month of October in support of the European release of our latest LP, "Amerikana". (I know! Wow! Finally!) Dates and cities will be announced soon! Coincidentally, we have also just recently made some progress in finding a potential outlet for European distribution via Fuzz Club out of London, UK. I say "potential" because they have very graciously offered to do a presale on their website for "Amerikana" (Cds and Vinyl) but those sales will determine whether or not it will be in their interest to continue to sell and distribute our records in the future. Of course such a deal would also help get our music into the hands and ears of a lot more people across the globe so it just feels kinda important. Big thanks to our U.S. label, Picture In My Ear for making this happen! So this is where I ask you, friends, for some good old fashioned grassroots support. We've got some pretty good forward momentum going right now and this is just one of those things that can really help keep it goin in that direction. So..... if anything we have ever put out into this world has meant anything to you over the last god knows how many years, I am asking you to help us continue to be able to put stuff out into this world by going to the link below and trading some of your hard earned federal reserve notes for something that was made with love, for you. (Yes, Really.) So Buy a Cd. Buy Vinyl. Buy both and give one to a friend. Put it in somebody's Easter basket this Sunday. (I'm pretty sure Jesus would want you to do that!) It probably goes wihtout saying that this isn't about money. Everyone knows that there is little to no money to be made in such endeavors. What I want are more opportunities for our music to be heard by more people! So if you feel like helping us do that then just go ahead and get yourself right on over to this little link right HERE! Thank you all in advance and a very big thanks to all who have already supported us in any way throughout the years. It sure has meant a lot to us. High quality digital WAV files can also be purchased at any of the below sites. 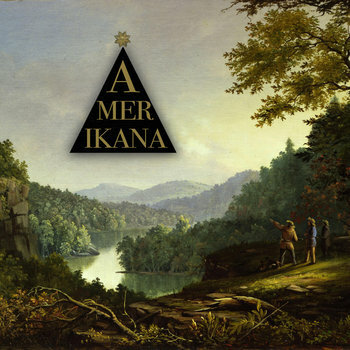 The Stevenson Ranch Davidians new LP, Amerikana, The band's first since 2009, represents a new direction for the band, with the dreamy, flowing sound of albums past infused with a fresh sense of inspiration, energy and purpose. An eclectic, yet cohesive, set of songs that glorify the human spirit while condemning those who seek to destroy it.